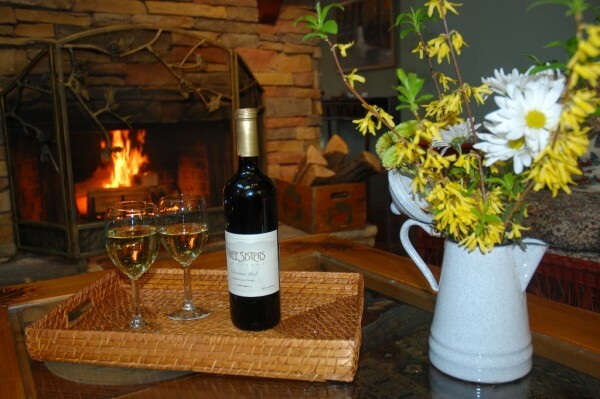 Dahlonega area / North Georgia Wineries – Winter is a Great Time to Visit! Sitting by the fire these cold nights and enjoying some of our great local wines, Dianne and I promised ourselves we would get out to visit all of our friends at the area’s wineries this winter and fill our wine rack! This is a great time of year to go winery hopping – the views are even better than usual, not only at the vineyards but driving around the North Georgia Mountains. There are less crowds, with the exception of Valentines Weekend. The hosts at the tasting rooms will have more time to share the unique stories behind the winery, the owners and of course the wines they make. Many also have expansion plans and can tell you about last year’s harvest and plans for the wine line up for 2014. Wolf Mountain Vineyards & Winery takes some time off in winter as their vines are sleeping. This very busy wedding and event venue will reopen on Valentines Day, but their Valentine Gourmet Dinner on February 14th and Saturday the 15th is already sold out. But, as of this writing, the Valentine Gourmet Brunch on Sunday, February 16th still has some tables available. The Boegner family then reumes operations: Sunday Brunch, wine tastings Thursdays – Sundays, Vineyard Cafe (lunch with a view) Thursdays through Saturdays with reservations required and Winemaker’s Tours Saturday and Sunday at 2 PM. Visit www.wolfmountainvineyards.com . From January 28th through March 1sr, 2014, Montaluce Winery & Estates will be open for lunch Friday through Sunday, dinner on Saturday at their Le Vigne Restaurant, with reservations suggested, and tastings Friday through Sundays. Montaluce is a little bit of Italy right here in North Georgia and only an hour from Atlanta – a nice getaway from the traffic and bustle of the big city. See www.montaluce.com . Another favorite with wine, food and views is Frogtown Cellars, www.frogtownwine.com . Their Panini Bar is open all afternoon Friday through Sunday this winter. The tasing room is open daily. February 14th and 15th, Frogtown will have a Valendtines Day Wine Pairing Affair at 7 PM each night with a four course “affair”, each course with a paired wine, plus dessert. Patrons rave about the fun they have at Three Sisters Vineyards. They are open Thursday through Sunday all winter. In addition to the normal wine tastings, they also offer both a Vintners Tasting – a specia list of their wines plus a Three Sisters keepsake wine glass, and a Georgia Wine Country Tasting: a VIP tasting for groups of twelve of more. Sharon and Doug are always entertaining. Visit www.threesistersvineyards.com . Cavendar Creek Vineyards, www.cavendarcreekvineyards.com , through the end of February their winter hours are Friday through Sunday afternoons (except February 2nd – Super Bowl Sunday). Live music is provided every Saturday and Sunday from 2 till 5 PM. They also have a gourmet meat, cheese and cracker tray available each day. Relatively new to the area is The Cottage Vineyard & Winery, www.cottagevineyardwinery.com , with spectacular mountain views as well. The current tasting room, which will be the wedding chapel when their large winery building is complete, is open daily. They are planning a special Valentines Day wine tasting and food event. Jim and Sandra Penner are a delight to talk to. With a rich family heritage of USA military service, the grounds also features a Military Honors Podium perched on a hill on their 29 acres. So, never mind the cold – it is warm inside all these great wineries. Come visit this winter – or anytime.